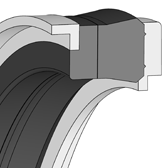 The KNA 16 u-ring has a compact design which guarantees good sealing in low pressure areas. The KNA 16 compact seal is a single-acting seal combined with a back-up ring and guide element on the side facing away from the pressure and a retaining ring for the axial limitation of the installation housing on the side facing the pressure. 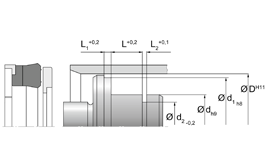 The advantage of the KNA 16 piston seal lies in the limited space requirement and its high resistance to gap extrusion.